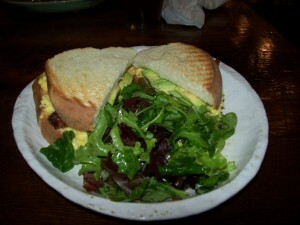 Recently, I’ve discovered that many local restaurants are adopting menus that include locally grown food. This concept is favorable because it gives business to and creates a reputation for local farmers. 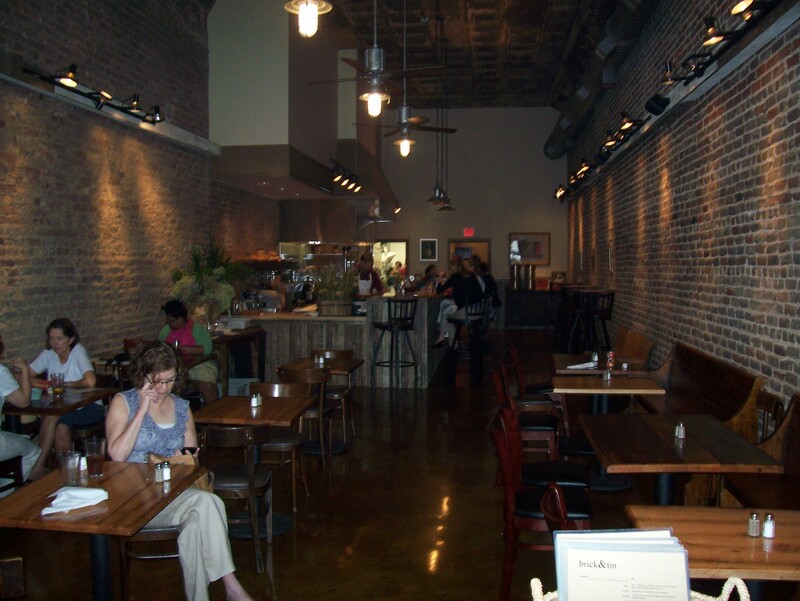 “brick & tin” which is located in downtown Birmingham, has adopted the same idea. This restaurant believes that people should know where their food comes from, so they carefully search for ingredients that are from local purveyors that are as close to home as possible. They also believe that it is important for people to enjoy food that is free of hormones, chemicals, or other additives. Meats prepared at “brick & tin” are humanely raised and the purveyors are serious enough to obtain an animal welfare certification. Ebonee and I ate lunch at “brick & tin”, at about 12:30pm on a Tuesday. Parking is kind of hard because there is no parking deck, so you must park on the street unless you walk. I drove around the block twice until I found a spot. 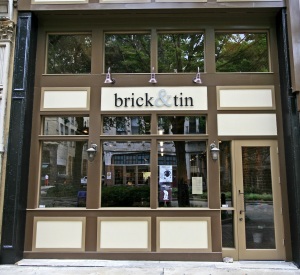 Once we entered “brick & tin”, I was amazed at its modern charm. It wasn’t crowded but there were still a lot of people inside eating. The decor seems to reflect the organic menu; for example, the walls are made of natural brick, the floors are made from a shiny brown concrete, and the bar is made of recycled wood. I also like the fact, that the inside is bright and airy. “brick & tin” has a common service flow. Once you enter, you look at the menu and then go to the bar to place and pay for your order. Then you get your drinks and your table. Lastly, a waiter will bring your food to the table. The menu consists of various paninis, salads, and two flavors of soup. There are also snacks/sides, and drinks. In my opinion the prices are really cheap, but the quality, taste, and presentation of the food is nowhere near cheap. I ordered the “Coosa Valley” panini which consisted of freshly made panini bread, scrambled farm eggs, sliced avocado, & bacon. 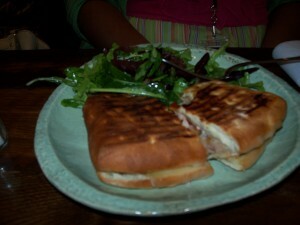 This panini tasted just like the egg sandwich that I make at home; on the other hand, the bread was much better. For $1.00 extra, it came with a side salad. I wasn’t a fan of the salad dressing because it seemed to have just been olive oil that was poured on top of the salad; however, I ate it anyway, but I didn’t eat it all. Ebonee ordered the “Cuban” panini which consisted of freshly made panini bread, slow roasted pork shoulder, smoky mountain country ham, pickled pepper relish, & gruyere (cheese). She also had a side salad. Ebonee enjoyed every aspect of her food, with no complaints. 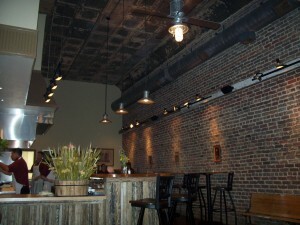 Overall, the food that we ate at “brick & tin” was acceptable. Next time, I will definitely order something else that might enhance my excitement about this restaurant. Furthermore, I feel that “brick & tin” is suitable for everyone, but especially for those who are health-conscious, and who want reasonably priced food.